Well meet season is finally here and it’s time I started updating this place on a regular basis. 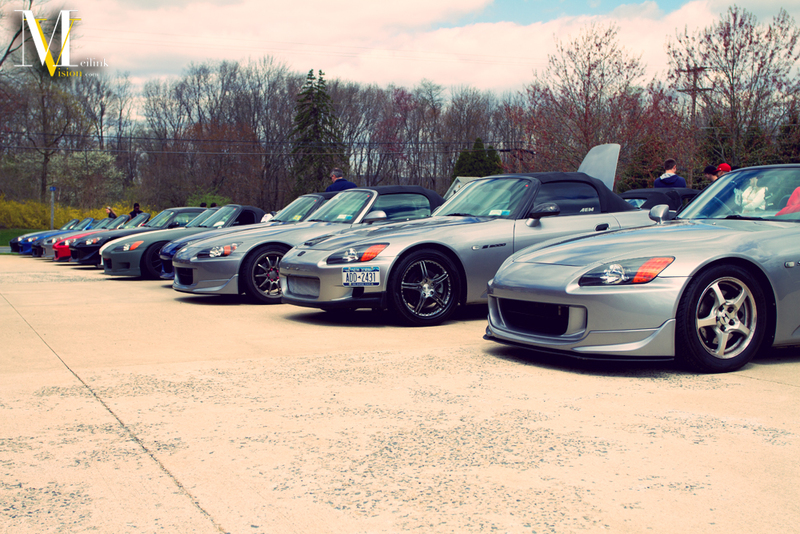 To start we’ll be looking back to last month for the First Annual S2000 Meet hosted by Evans Tuning. I’m a big supporter of Evans Tuning and recommend them to anyone that ever asks me for a place to get tuned. I’ve had my ITR tuned there numerous times and my brother, Rich, had his old GSR swapped Integra tuned there too. Rich also had Jeff build the transmission for his beastly turboed RSX and I’ve also had him do some other work on the ITR. I was having oil pressure issues last summer that I could not diagnose myself and Jeff took care of everything for me and it has been running great since. Anyways back to the meet stuff. 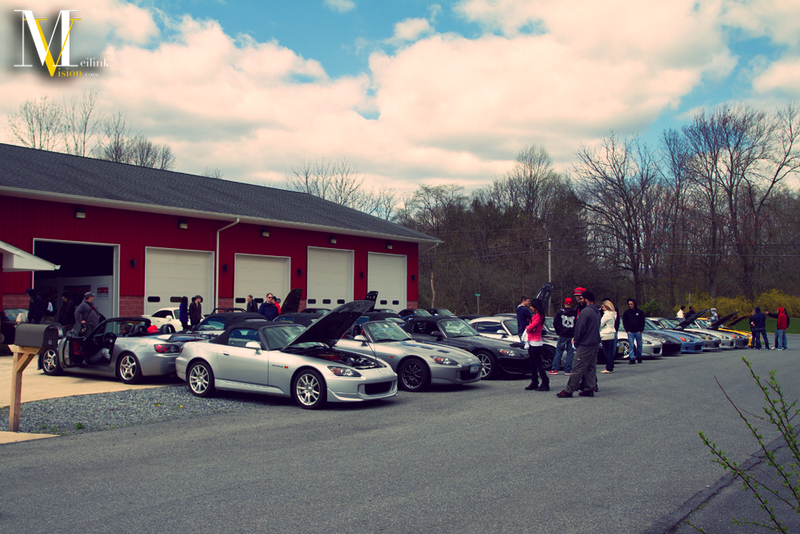 The meet was only open to s2000s and preregistration was required to attend. I forget the exact count, but I think it was 43 s2000s were in attendance, which was pretty much everyone that signed up and it was great that everyone came considering how the weather was looking. The week leading up to the meet it was supposed to rain all day Saturday. Come to the Friday beforehand and it’s raining, but the weather is saying it’ll clear up by 10am Saturday. I woke up the next morning to of course what other than rain. I kept hitting snooze for the next hour debating if I wanted to get up and take the drive. Justin (jst2878) hit me up by this point and I was convinced to go. We scheduled a meet up spot with the other LI guys and I headed over. There was a bit of confusion and I left without them thinking they left without me. Eventually we all caught up about 20 minutes away from Evans Tuning and decided to wipe our cars down. It had completely stopped raining before we left the island and the sun was coming in and out. The Long Island guys I rolled with. 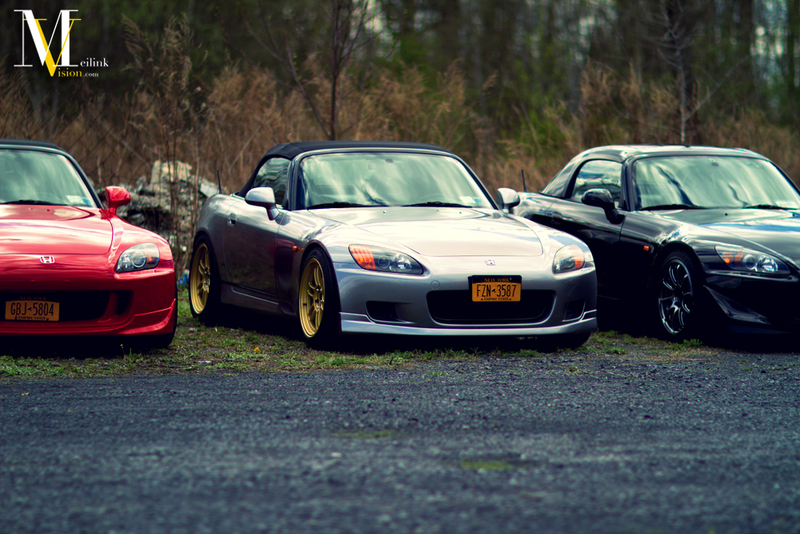 Habib’s (beeb05sti) NFR AP2 with new RPF1’s in the SBC finish, then my AP1 on my new gold RPF1’s, Justin (just2878) with his AP2 being blocked by my car, and then John (topplayer) with his BB supercharged AP1. A shot of the full line up. And one more before we finished the last 20 minutes of the trip. Being that we were the late comers to the meet, we were the first to start a new row on the unpaved section. The other group of LIers, that left much earlier than us, came over to greet us all. A group shot of all the s2000’s in attendance. An overhead shot of Stan’s interior. It’s very well put together and carries the red and black theme through out. He has the red Recaro pole positions and everything else has been finished black with red stitching; the door panels, center console and shift boot. 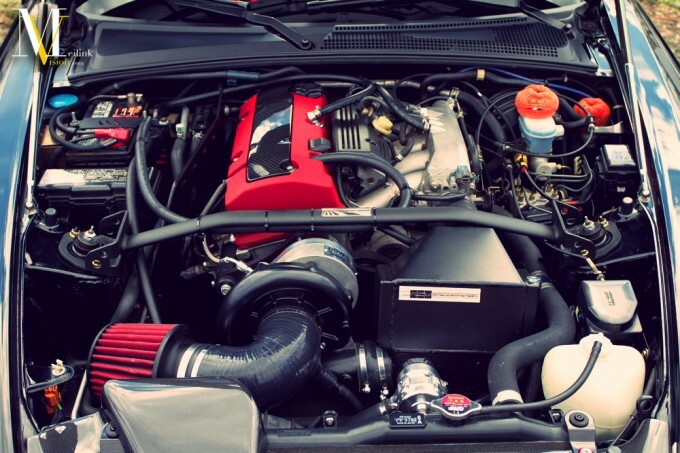 Here’s a shot of John’s (ivtecallday) turboed ap2 on ccw’s. 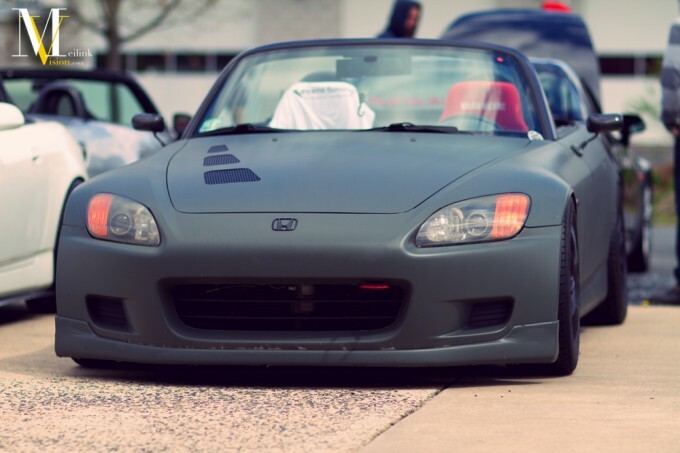 This AP1 is going in a great direction. I really like the yellow/gold, black and grey theme going on. All it needs is a set of wheels and it would be awesome. 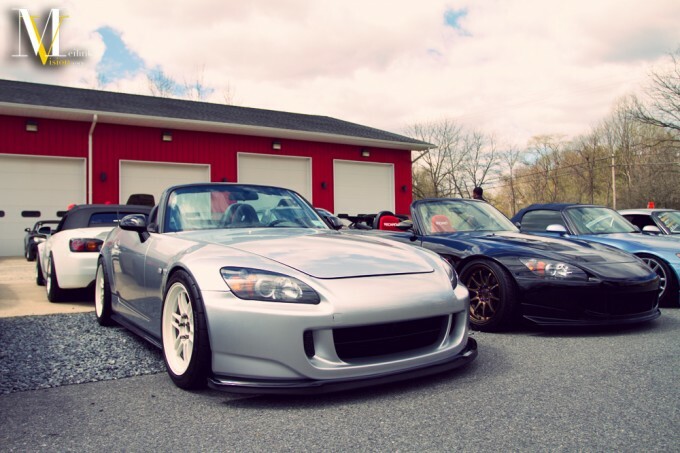 Joey’s (hows2kru) AP1 with an ap2 conversion and sitting on Championship White Rpf1s. 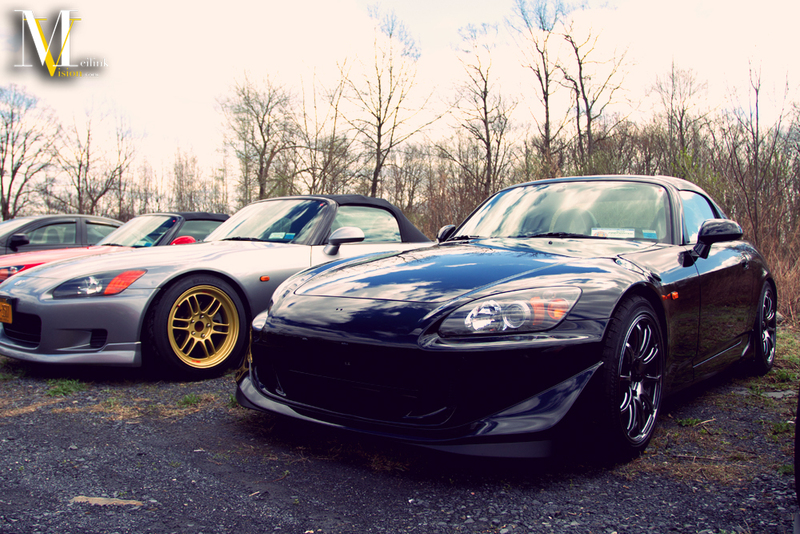 If you haven’t noticed Rpf1’s are the go to rims for s2000 owners. They’re a great wheel, that isn’t a knock off, light weight and comes in a variety of sizes to get great fitment. 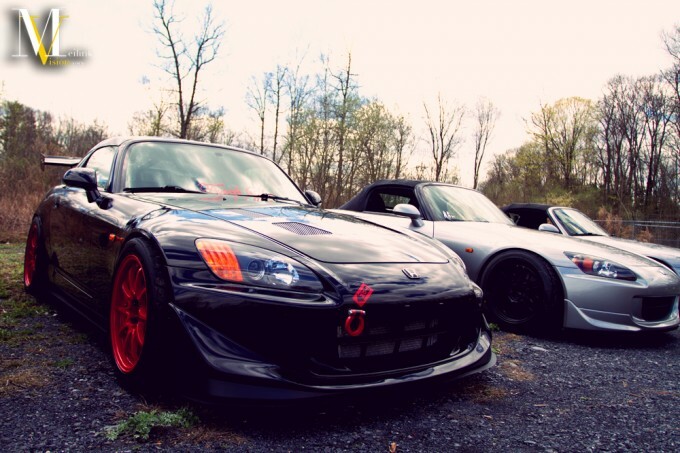 Jeff Devo’s (minitoyota) Honda Tuning featured s2000. Jeff now works with Jeff Evans at Evans Tuning. I got some time to catch up with Jeff D for a bit and as you’ll see it’s had a bit of a front face lift since I shot it for his Honda Tuning feature. He still has a lot to do with it and told me this was the first time in two years it had seen sunlight. Either way the car will definitely be something to look out for. A couple of line up shots. Interesting color choice for this AP1. Like the color choice for the wheels here. Exterior and underhood shot of John’s AP1. Justin’s Ap2 rocking the hardtop and some new advans. A shot of my AP1. A little time after the catered lunch they started brining in cars to dyno. 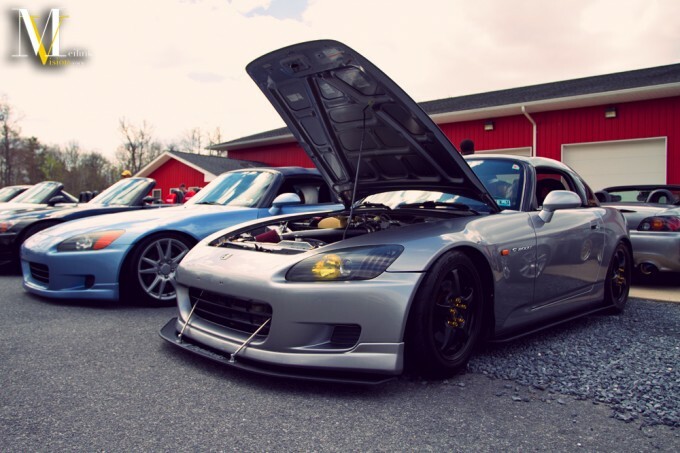 Here’s a shot of Jeff D getting this AP2 ready. 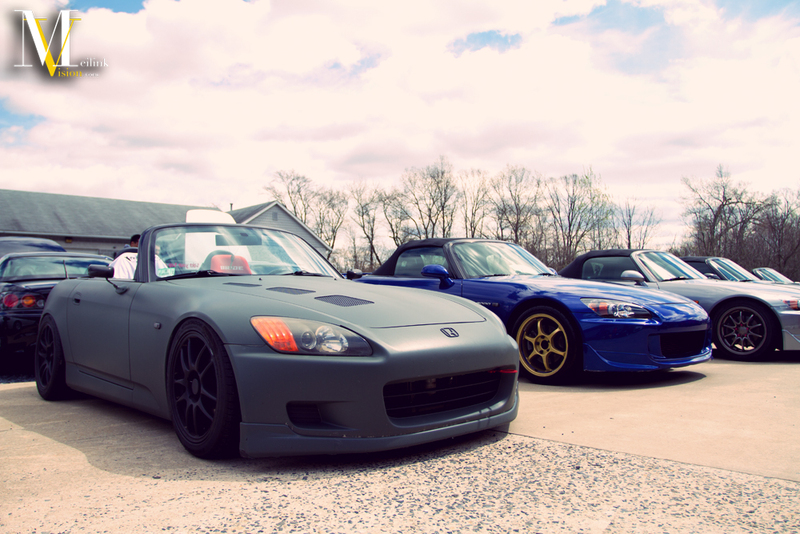 Another AP2 rolling on the packs. We didn’t stay to see the finish of the dynoing so here’s where the coverage ends. Next up in the coverage list will be the the grand opening meet at Elite Motorsport, check back soon.